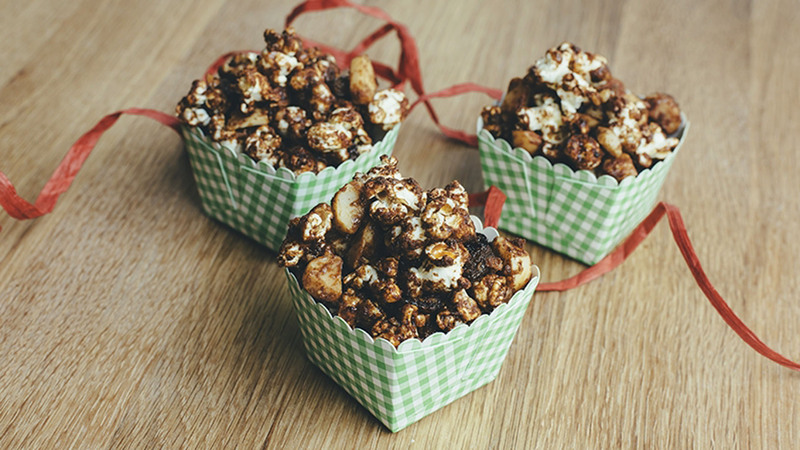 Fill your home with the scents of maple, cinnamon and freshly popped popcorn with this tasty treat. 1. Preheat oven to 150°C fan forced. Line 2 large baking trays with non-stick baking paper. Place the popped corn, macadamias and dried fruit into a large bowl and set aside. 2. In a medium saucepan place the brown sugar, maple syrup, butter, salt and spices. Cook over medium heat for 5 minutes, stirring constantly. Reduce heat to a simmer and cook for a further 5 minutes. Remove from the heat and stir in the baking soda. 3. Pour over the macadamia mixture and combine well. Divide the mixture between the trays and bake for 40-45 minutes, stirring every 15 minutes. Allow to cool on trays. Note: Popcorn can be stored in airtight containers for up to 1 week.